The Borders General Hospital at Melrose. 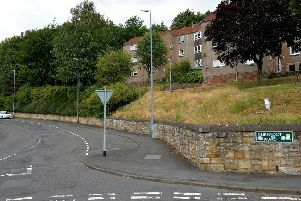 A drunken 30-year-old man staggered from a children’s playpark in Scott Park, Galashiels, to tennis courts nearby and behaved in a threatening or abusive manner, a court heard. Shane Lawrence, of Galashiels, pleaded guilty at Selkirk Sheriff Court to committing that offence on November 24. Police had already been contacted about Lawrence’s behaviour in Scott Park by the time he headed over to the tennis courts, went into the changing rooms there and began shouting and swearing and punching walls. Two tennis coaches managed to usher him out of the changing rooms, and the police then took him to the Borders General Hospital at Melrose because of his intoxicated condition. Defence lawyer Ed Hulme said Lawrence had been on a downward spiral following abreak-up with his partner and had moved to Galashiels from Edinburgh. Lawrence was ordered to carry out 100 hours’ unpaid work as an alternative to jail.